An easy recipe for whole roasted cauliflower, seasoned with olive oil, garlic and paprika. The cauliflower comes out beautifully browned on the outside, and tender on the inside. It was my dad who inspired me to make whole roasted cauliflower. Dad is a great cook, always happy to try new recipes. When he sent over this beautiful photo, I just had to try it too! Dad gave me a fairly exact recipe, but as per usual, I am incapable of following a recipe without making any changes. 😳 So I altered a few things, and we just LOVED the result. I’ve made it several times since, because it’s so easy, pretty and healthy! That’s the million dollar question! There are so many variations on this recipe. 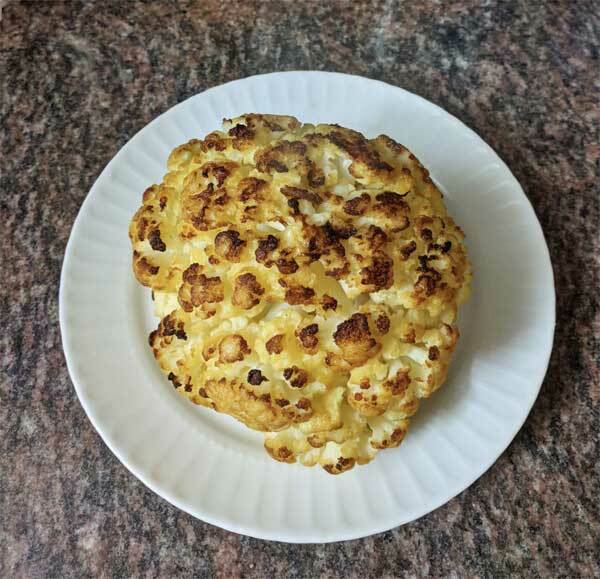 The main challenge when making whole roasted cauliflower is that you want to make sure the cauliflower is cooked through before the outside is burned. My dad boils the cauliflower first for 10 minutes, then roasts it at 350°F for 45-60 minutes, depending on its size. But I’m lazy. The thought of a two-step recipe (and an extra pot to wash) seemed daunting. So I decided to simply roast the whole cauliflower in the oven. To ensure the inside becomes tender, I poured a little water into the pan. This ensures that the outside gets nice and crispy, while the steam from the water penetrates the inside of the cauliflower, helping it to soften. Scroll down below to the recipe card for full instructions. But I find that roasting for 80 minutes at 350°F works perfectly. Can I roast cauliflower at 350 degrees? Sure! When I make parmesan roasted cauliflower, I like to roast it at 425°F. But when making whole roasted cauliflower, it’s best to roast at a lower temperature, to ensure even cooking. Should I remove the core? No, you shouldn’t. Cauliflower stems (and the leaves too) are completely edible. Removing the core, even very carefully, can cause the cauliflower to fall apart. I do remove the outer leaves and cut the bottom of the stem, but I leave the core intact, and I find that it softens nicely and is delicious when roasted. By the way, roasted broccoli stalks are also edible and very tasty! How to serve whole roasted cauliflower? First of all, make sure you bring it to the table whole! It’s so pretty. You can cut it at the table, after everyone admires your tasty work of art. As for what dishes go with whole roasted cauliflower, anything goes, really. Much like cauliflower steak, it’s substantial enough to even serve as a main dish, with perhaps a side salad. Or you can serve it with fried or poached eggs. If you’d like to serve it as a side to meat or fish, it’s completely your call. It’s such a versatile side dish, it goes with anything. I like to serve it with honey baked chicken or with keto meatloaf, because I can bake both in the same 350°F oven. You can keep leftovers of this whole roasted cauliflower in the fridge, in an airtight container, for 3-4 days. Reheat them gently in the microwave, on 50% power. They are also good cold! An easy recipe for whole roasted cauliflower, seasoned with olive oil, garlic, and paprika. The cauliflower comes out beautifully browned on the outside, and tender on the inside. Preheat oven to 350 degrees F. Pour 1/4 cup water into a square baking dish. Remove the cauliflower's outer leaves but leave the stem intact, trimming it just a little so that the cauliflower head can stand upright in the pan (as shown in the video). Wash the cauliflower and dry well with paper towels. Brush the cauliflower all over with the olive oil, and sprinkle with the seasonings. Spray the seasoned cauliflower with olive oil spray. Place the cauliflower head, stem side down, in the prepared baking dish. Roast, uncovered, for 40 minutes. Carefully remove the pan from the oven, placing it on a trivet mat and leaving the oven on. Use two wide spatulas to temporarily transfer the cauliflower to a plate. Wipe the pan clean with paper towels (careful, it will be hot). Pour 1/4 cup more hot water into the pan. Make sure water is hot, especially if using a Pyrex pan. Return the cauliflower to the pan, stem side down. Spray it with more olive oil. Place the pan back in the oven, and continue roasting the cauliflower until the outside is browned and crispy and the inside is tender-crisp, about 40 more minutes.